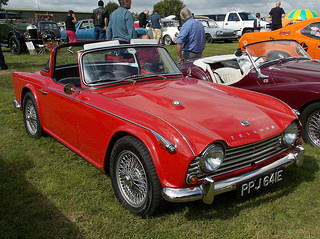 The Triumph TR4A sports car was introduced in 1965. 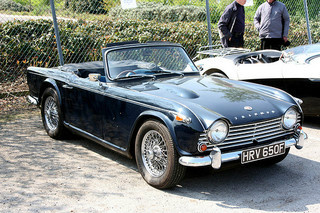 Like its predecessor, it was a two door, two seater convertible and, in effect, reflected a further evolution of the TR4. The only exterior changes were limited to a new grille, some chrome strips on the wings, and a distinctive IRS badge at the rear. It was updated with a new chassis which included the introduction, for the first time, of independent rear suspension, which was given the designation "IRS". 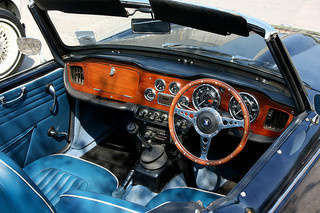 The addition of IRS, which was, in itself, quite a complex system, was to offer the market a roadster with a noticeably more comfortable ride. 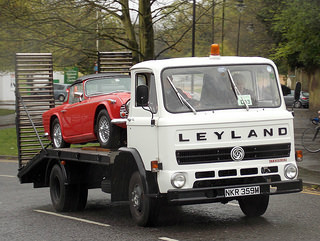 In the past, the TR2 to TR4 were noted for their firm suspension. 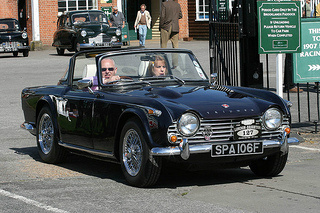 In the early 1960's, the view at Triumph was that the TR4 was regarded purely as a stop gap measure. It was seen simply as a further step in the transformation of the rugged TR2 into the relatively sophisticated, technically advanced and thoroughly modern TR6. At that time, US distributors were still of the view that, so long as the price was right, they could still sell TR's with a live rear axle. Furthermore, they believed that road holding was not the key to sales in the US, and that IRS was bound to be more expensive. 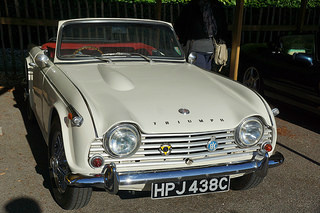 Consequently, although Triumph wanted a TR sports car with independent rear suspension, they still had to bow to the strong pressures from US dealers for the traditional system. So, it was agreed that the new chassis, incorporating IRS, would accommodate both suspension formats. 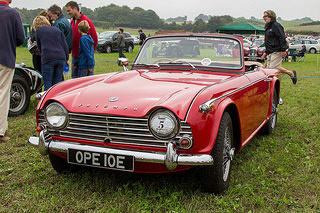 To take into account the comments of US dealers, some 25% of TR4A's built would retain the solid rear axle which had been a feature of the TR2 to TR4. With the remaining TR4A's sporting IRS, this model became the first car to offer, as an option, either type of rear suspension. 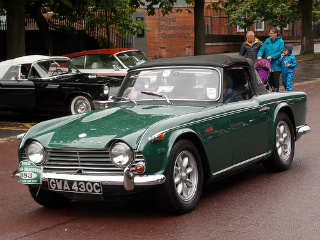 Of the 28,465 TR4A's built, 25,390 were destined for export, with 3,075 retained for the UK market. 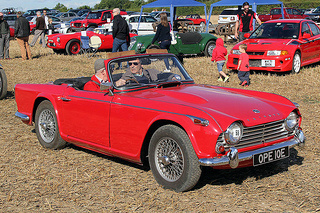 Although Triumph management wanted the TR4A to have a more powerful engine, their own 6-cylinder units were not suitable at that time. Therefore, it was decided to continue with the uprated 2.1 litre Vanguard engine since attempts to generate more power by boring it out to 2.5 litres were unsuccessful. 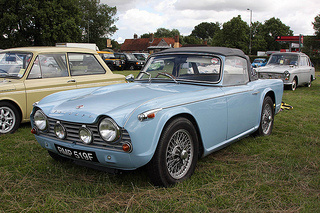 The TR4A was subject to a small increase in power from 100 bhp, as in the TR4, to 104 bhp to take into account the fact that, due in part to the IRS, it had become slightly heavier than the TR4. 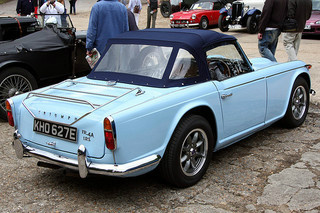 Like its predessor, the TR4A was also available with a fixed hard top, including the detachable "Surrey" top. This system was the forerunner of that used by Porsche with their Targa variant. The media welcomed the new IRS suspension, but were not impressed by the fact that its performance was little changed from that of the TR2/3. 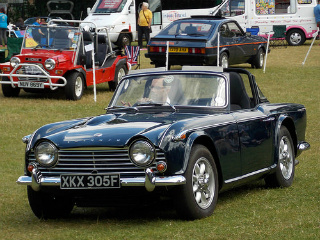 In the beginning, the designers at Triumph had been asked to produce a TR4A with a noticeable increase in performance and economy, as well as a high speed touring ability on the up-and-coming European motorways. These requirements, coupled with new emission control regulations coming into force in the US, would finally be the death knell of the 4-cylinder TR. 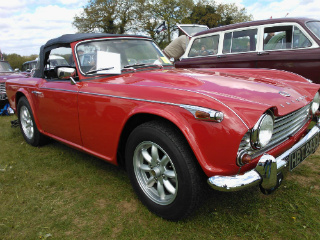 The answer came in 1968 with the appearance of the TR5 and TR250, combining the TR4 styling coupled with a new 6-cylinder engine. 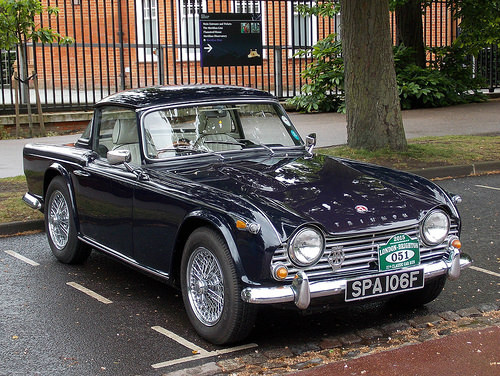 A 1965-67 Triumph TR4A, in good condition, could fetch between £15,000/$24,000 and £21,000/$34,000, whilst an outstanding example could command around £36,000/$58,000.